I don´t know if you have read The Hunger Games or seen the films they made of these books. Pippa is a big fan and dragged me off to the cinema to watch them. I won´t ruin the plot but the story involves young people meeting untimely and often violent ends, often at the hands of others of a similar age. This is an interesting and disturbing theme and breaks the Hollywood mould somewhat. After all the ones who get killed in the movies are usually “baddies” and, franky, we are all perfectly happy to see the end of them. In the Hunger Games a bunch of kids are selected and thrown into some huge arena where they have to survive and kill one another until only one remains. It is the kind of thing that the Romans would have loved but with a few futuristic elements thrown in for good measure. Happily, he never gave up until the day when the fish was unusually slow off the mark and his little ruse paid off. The trout was duly landed, knocked on the head, stuffed and mounted on the wall and the cold stare of that glass-eyed trout could teach us just as well as the words of some Sunday school sermoniser, about the importance of perseverance. Out on the Guadalhorce river it is often the case that we need to calculate the odds of a fish being landed. Often the better fish live close to the sanctuary of snags and will make for them as soon as they are hooked. The initial run of a reasonable barbel or carp is usually very powerful and before they can be landed they need to dissipate some of their energy, usually through a series of runs. Every now and again you need to size up the odds hoping that they “may be ever in your favour” but there are times, frankly, when they favour the fish. In a narrow section of river with trees on the far side with trailing branches you can often hook a fish and encourage it to run downstream, hopefully to a pool which is relatively snag free. It helps if you can keep well off the river. If the fish sees you it is more likely to run directly from you and that, of course, means trouble. I don´t tend to land fish in a net and normally don´t even carry one, relying instead on shallow margins on which to beach the fish. If deep water combines with snags and a suitable landing site is not available I tend to leave the fish alone. It is just a question of weighing up the odds. Here is my son Leo. 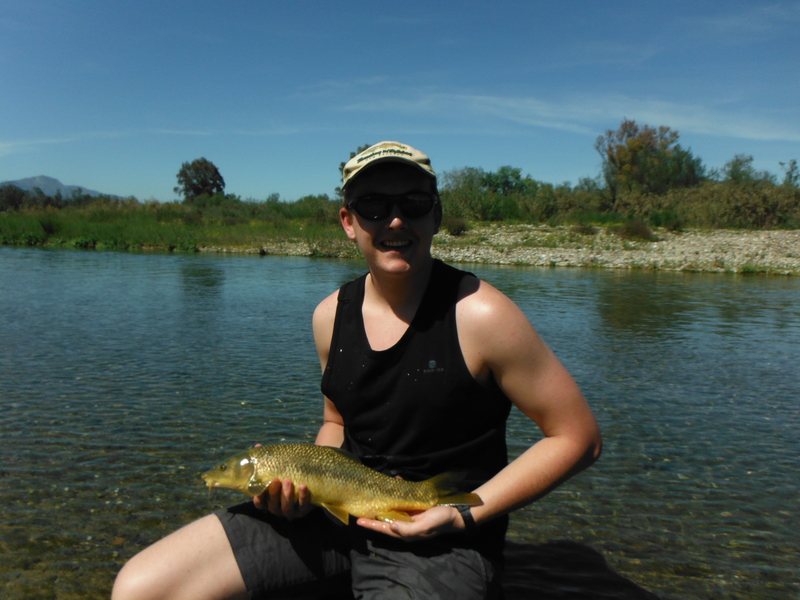 He hooked and played this fish very skilfully in a relatively open water. The odds were in his favour.